Join HBH for their first Public DIY Workshop at their new space! 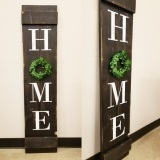 This 12x48" HOME sign will make your house ready for spring in no time! All signs come with a real boxwood wreath. You will be able to choose your stain and paint colors during the workshop. Registration closes on April 6, 2019.